Politico ran a story last week, alleging that Bill Clinton used taxpayer money to stake Hillary’s homebrew server. Frankly, I found that revelation to be very uninteresting. What caught my eye is the retirement package that Presidents get … more than $1 million per year for life in comp & benefits. 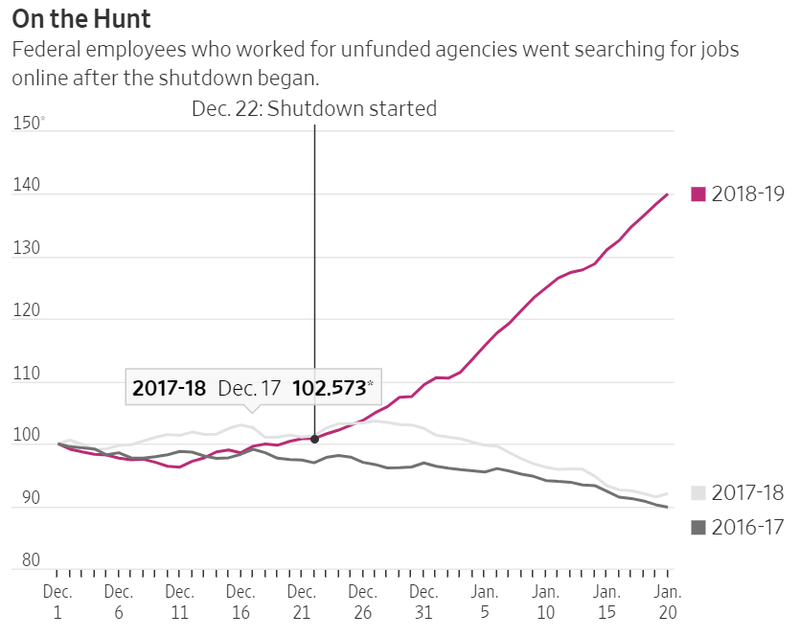 It’s not new news, but the Post points out that firing a federal worker is almost impossible, and making a termination stick, is even less likely. Think about it: 1 in about 200 get culled each year. Hardly Jack Welch’s “bottom 10%” program. More generally, data from the Office of Personnel Management indicate that it is five times as hard to get fired from a federal job as from a private-sector one. 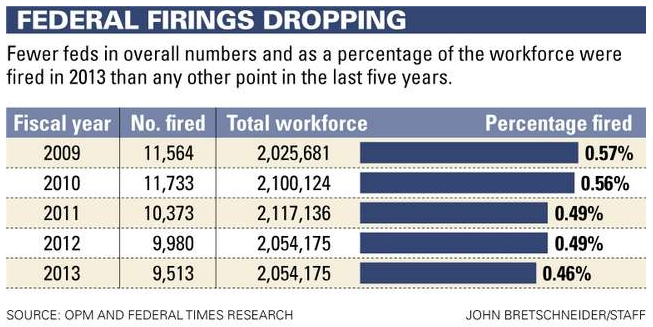 It’s commonly claimed that federal workers settle for lower pay in exchange for job ­security. The Post says: Don’t believe it. Congress cut military pensions … did they cut their own? The flap over the budget deal that cut military pensions – including those for disabled vets — resurrected an old question of mine: I’ve always wondered what retired members of the Congress and Senate got to live on when they retired. The election in a nutshell … maybe jobs don’t matter as much any more! There’s a sobering, must read editorial in the WSJ today … Can Government Benefits Turn an Election? The federal government’s 120 means-tested programs today provide $1 trillion of benefits. The spending for these programs has grown 2½ times faster during the Obama presidency than in any other comparable period in American history. To what extent might these benefits not just foster dependency but also make the economy’s performance seem less of a deciding factor in voters’ choices? If you are concerned about your well-being and worried about a failed recovery — but getting new help from the government— do you vote for the candidate who promises more jobs or do you support the candidate who promises more government benefits? Voters have historically set high standards and voted out incumbents not because they personally disliked them. Rather, they’ve elected a new president because they understood the importance of a strong economy to their jobs, their income and the future prospects of their children. Based on the economy, Mr. Obama should lose on Nov. 6. Yet it seems implausible that tens of millions of Americans who have received additional government benefits during his presidency can be completely unaffected by that largess. The election will test the relative power of private-sector aspirations and public-sector dependence. Based on the economy, Mr. Obama should lose on Nov. 6. Yet it seems implausible that tens of millions of Americans who have received additional government benefits during his presidency can be completely unaffected by that largess. The election will test the relative power of private-sector aspirations and public-sector dependence. Keep in mind that most jobs being created are relatively low paying service sector jobs … an increasing number of which are part-time … in part of duck Fed regulations and taxes (think, ObamaCare). To get a visceral sense of the electoral “tension”, read Threats to Assassinate Romney Explode After Debate. And, consider that an increasing number of folks feel that they are paying their fair share (or more) with the government wasting much or most of the taxes it takes in … what if those folks decide it’s not worth 60 hour weeks any more any more and shift into neutral? This year’s election won’t be the end of the process … regardless of the outcome. President Obama drew guffaws during the date by jabbing Romney for having a bigger pension. You know, kind of a reverse guy’s “big thing” contest. According to CNBC, Obama’s pension isn’t exactly teeny-weeny … and, we tax payers get to pay for it. Pension Envy: Who Has More — Obama or Romney? When it comes to the presidential candidates’ pensions, size matters in more ways than one. As president, he will receive $191,300 annually for life — win or lose in next month’s election — and receives a travel allotment as well as mailing privileges. Should Obama lose, his presidential pension kicks in immediately after leaving office. 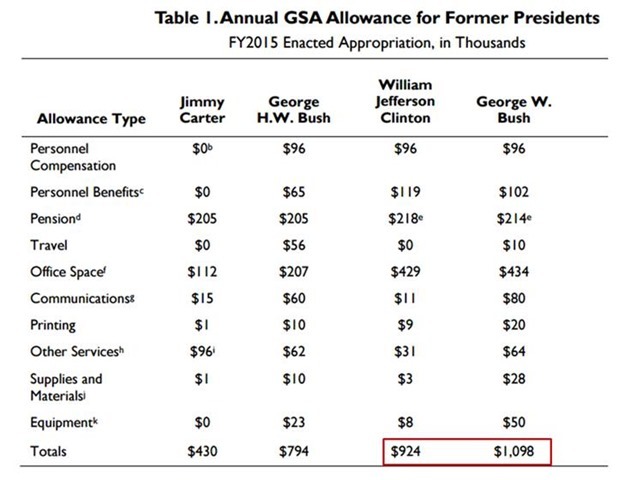 Given that the president enjoys a normal life span, the pension allotment would be worth upwards of $6 million. In addition, Obama may be due a nice pension for the eight years he served in the Illinois Legislature as a state senator. Dennis Miller – comedian & political commentator – does a regular Wednesday nite segment on O’Reilly. If you’ve got a family of 4 and you’re busting your hump 40 or 60 hours a week – maybe 2 jobs — to make $45 grand and make ends meet … if Obama gets re-elected, just quit. Kick back … take the handouts and enjoy life. If you don’t, those who are just riding the train will be laughing at you. Why keep hitting your head against the wall? Struck me at the time as akin to Rick Santelli’s “We need a Tea Party” rant on CNBC. O’Reilly’s words seemed quite hollow in comparison to Miller’s. And, reminded me of the government government promotional campaign to counter the “pride and other beliefs” that keep people from signing up for the SNAP program and getting food stamps. Local assistance offices have been rewarded for “counteracting” pride and pushing more people to sign up for benefits. The Ashe County Department of Social Services in Jefferson, N.C., for example, received a “Gold” award for confronting “mountain pride” and increasing food stamp participation. Overcoming “beliefs” is a stated method from the USDA to bring more people to the program. A “Supplemental Nutrition Assistance Program (SNAP) Community Outreach Partner Toolkit” details the importance of reaching people who … have beliefs that conflict with accepting food stamps. Since the USDA has “mountain pride” in the win column, will “work pride” be the next to fall? I think Miller is onto something. Who pays taxes? Who benefits? … Here are some nums. 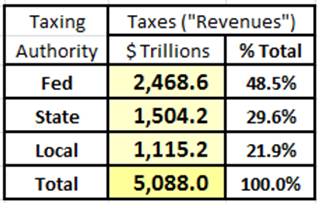 The Federal tax revenues in 2004 were a bit over $2 trillion … compared to our $2.5 trillion projection in 2012. 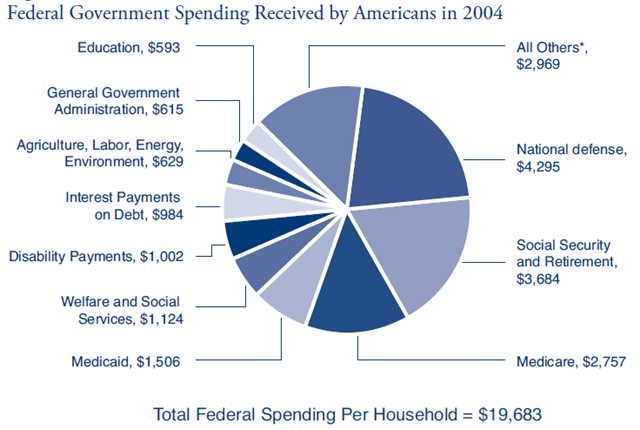 Here’s how the 2004 tax revenues were spent … i.e., the benefits received by citizens. 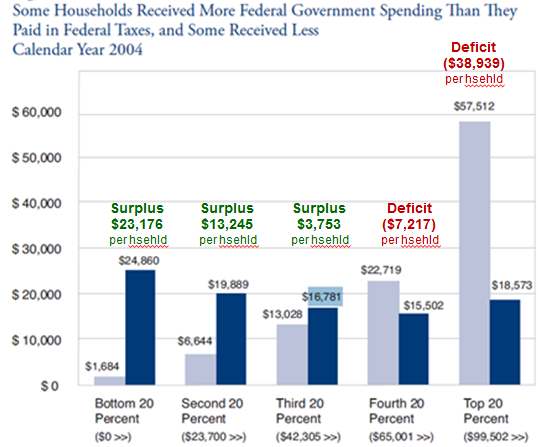 Note that the Federal spending is just under $20,000 per household. The Tax Foundation analysts also sorted taxes paid by household income pentile against benefits received by the pentiles ….. and things got interesting. The bottom pentile – households in the bottom 20% of income – pay about 2.5% of Federal taxes (including payroll taxes !) … and receive 1/3 of government benefits. The top pentile pays over half of the Federal taxes and draws about 15% of government benefits. 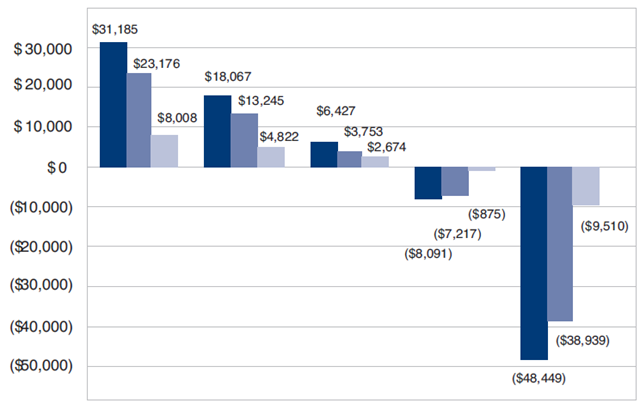 The middle pentile comes close to breaking even – paying 14.1% of Federal taxes and getting 16% of government benefits. On average, households in the bottom pentile get $23,178 more in benefits than they pay in taxes; average households in top 20% run a deficit of almost $40,000 – that is, they pay about $40k in taxes than they receive in benefits; the breakeven point is somewhere around $50,000 in household income – that’s where taxes paid equal benefits received. When state & local taxes and benefits are factored in, the surpluses and deficits grow even larger. The bottom 20% gets over $31,000 per household in net government benefits; the top 20% pays almost $50,000 per household more than it gets in government benefits. The breakeven point is still somewhere around $50,000 in household income – that’s where taxes paid equal benefits received. I’ll be hunting for more recent data. Until I find it, chew on this! Note: The Tax Foundation says it doesn’t have funding to update its study.